♥ Starfighter Slouch Hat by Tracy Cox (Free download on Ravelry). I knit this in MadelineTosh Pashmina Worsted “Gilded” for the February Eat.Sleep.Knit. KAL. –> I discussed the balloon method for blocking hats in this section. It’s inexpensive and very effective! ♥ I’m still plugging away on my Moderne Log Cabin blanket for my daughter. This block is a big one. –> I showed my Bin to knit before 30 April and discussed what was inside and still left to do after my current project. ♥ Hello Yarn SWM “A Bit Glaikit” is done! 4.0oz/2-ply/~300yds. These are going to be awesome socks in the near future! ♥ I started spinning Two if by Hand SW BFL/Nylon in the “Rina” colorway. ♥ Sweet Georgia Trinity Worsted yarn from Eat.Sleep.Knit. Happy Wednesday, kitten! Thank you for spending some of your time catching up with me today. This is a longer episode with an FO, a couple of WIPs, some discussion about what I plan to make next, and a large amount of stash enhancement of all kinds! Show notes can be found on the blog at SewKnitpicky.net, and please consider joining the Knot A Podcast Ravelry group! ♥ Autumn generously donated project bags as prizes for the Clean Slates and Big Things craft-a-long! I also announced my ideas for some other prizes. ♥ It’s finally snowy and cold here. Winter sure was late and will likely be short-lived. In spite of some hefty crafting goals in 2016 (or perhaps to aid in them), I had a mildly crazy idea come to me in the second week of January: I should issue myself a challenge similar to what the Completely Twisted and Arbitrary group over on Ravelry does and place braids of fiber in a bin for me to spin up by a certain period of time. Wait. How about I add a bin of yarn that needs to be knit in that time as well? Even better: how about I make myself give away anything I do not spin or knit up in that time from those bins?! The idea is really quite simple. 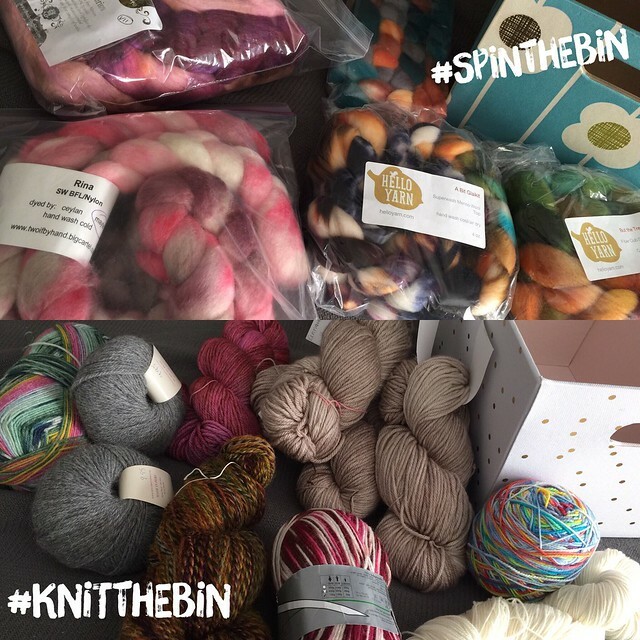 Every 4 months I will fill the respective bins with fibers and yarns I want to use in that period of time. The first set of Bins are to be used up by 31 April, 2016, at which point I reset the bins for May, June, July, and August. It shouldn’t be so easy that I will knock the bins out without much effort but not so hard as to make the task demoralizing and impossible. I can add on projects at my discretion that are separate from this challenge, but I am not allowing myself to do any substitutions. I am hoping to do monthly updates on the state of this challenge, both with what I’ve finished and what I have left to do. Be watching for the first one later in February! Do you like to make games to accomplish goals? Are you doing something similar to this? I would love to see what you plan to work on. ♥ I’ve resurrected the Moderne Log Cabin Blanket! I’m on Block #7 and hoping to finish it in February. I want this blanket done by the end of 2016! ♥ Right now I’m in love with big cozy sweaters! I want to start my Wolf River by the end of the month, but I’m also eyeing Winter Traveller and PNW #1.